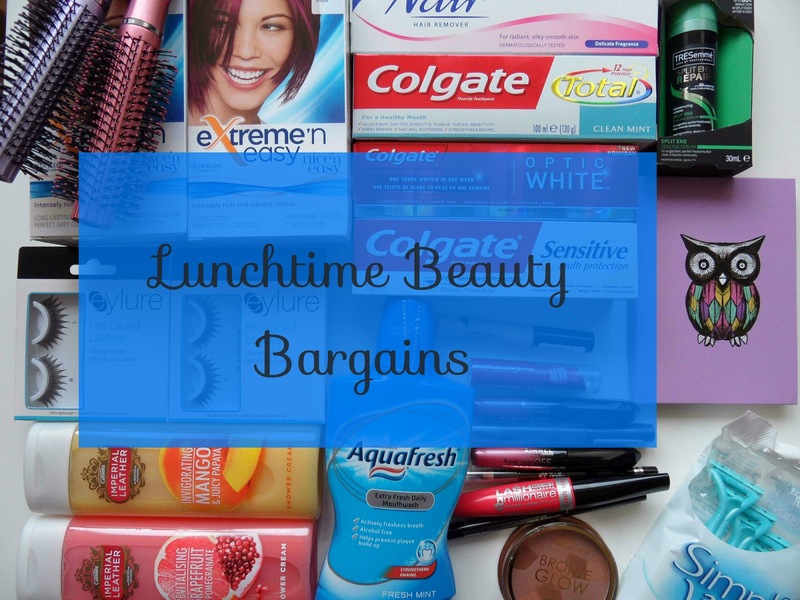 Today I think I managed to excel myself with some mega lunchtime health and beauty bargains that I just had to share with you all. All these products came from Poundworld, Poundland or trusty old Boots. Just how adorable is this notebook?! Obviously I didn't need it but it's the perfect size to carry around in my handbag and jot down my many lists etc so I just couldn't leave it sitting in the store. My local Poundland actually had a great range of stationary. One item I did resist was an A4 notebook with a watercolour effect stag on the cover, TOO GORGEOUS, I think I'm going have to pop back and pick it up now the more I think about it. Collection Bronze Glow Mosaic Bronzer worth £2.99 FREE when you spend £5 on any Collection product. I have been dying to try the two Collection products for a while now, so the free Bronzer is a bonus, although I am paler than Casper so that may be passed onto a friend and although I don't need a new mascara, the two Miss Sporty products for £3.49 was just too good a bargain to pass up. I'm really intrigued by the applicator of the mascara so I'll give it a go. Boots have some really great offers on their cosmetics at the moment, I think if I wasn't strapped for time, I could have done some serious damage. I didn't even get near the Soap and Glory products so I will need to arrange another trip soon. Ahh Poundworld, how I love thee. I did a quick dash into Poundworld before heading back to my car on the off chance I could pick up some grass seed for my garden (exciting, eh?!) but I managed to get distracted by the health and beauty section instead. They had loads of the Rimmel "Show Off" lip lacquers which seem to just be the Apocalips, perhaps they are old packaging. So I picked up two shades. The Eylure pre-glued lashes in 191 are one of my favourites as they are really natural for me. I'm not a fan of really bold strip lashes. Granted I'm not hugely keen on the pre-glued aspect of these but I've used them in the past asn just applied my own glue and they are perfect. And lastly the Nice 'n Easy extreme dyes. Now most people who have bright red/ pink hair like myself tend to pre-lighten their hair before applying their crazy colour/ directions shades but personally I actually darken my hair. I have dark blonde hair and my roots come in quite light. I like to use a red or purple box dye once every 3/4 months and then apply my Rose Red Directions on top of that. It may seem like a crazy idea but I've done it now for over seven years and it works. It gets me the shade I like and since I only use these boxes every few months, my hair stays in great condition. So to get these for £1 each is a complete bargain for me.